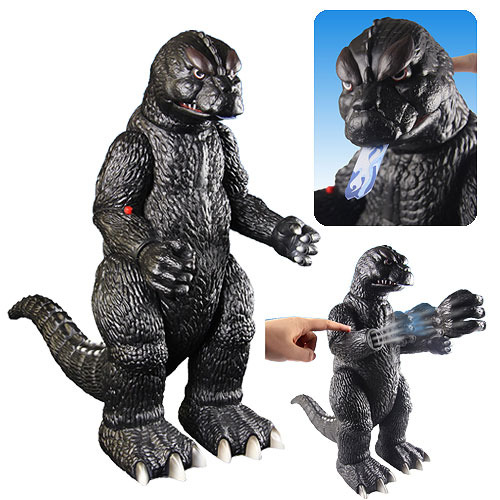 Godzilla features flicking-tongue action, rolling wheels, and a firing right fist! Jumbo action figure replicates the original vintage design. Journey back in time to the 1960s with this ginormous Godzilla Shogun Warriors 1964 Jumbo Action Figure. Made of plastic to replicate the original vintage design, Shogun Warriors Godzilla features flicking-tongue action, rolling wheels under his feet, and a firing right fist! He measures approximately 21-inches long x 19-inches tall x 9-inches wide. Ages 17 and up.